Trail Type: Up to you! Piece together up to a 110-mile loop around the island, hike point-to-point to traverse the island along the Greenstone Ridge in 40.4 miles, or zig-zag across the island as you desire. Navigation: Easy, junctions are well marked with mileage and trail names. 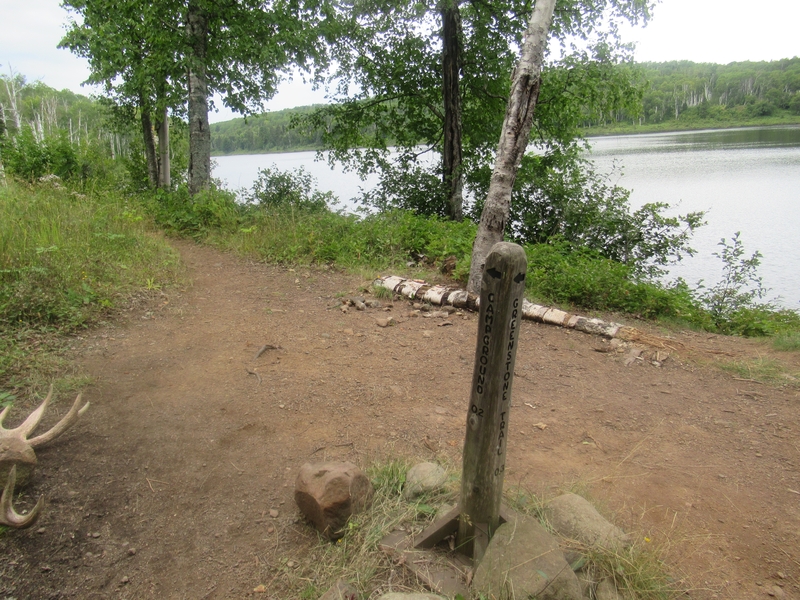 The most popular trails are well maintained. For a brief overview check-out the park provided map, but for trip planning and navigation use the detailed National Geographic map available for purchase online and at the park offices in Houghton and Rock Harbor. There is an entrance fee of $7 per day per person to visit the island. National Park and Federal Recreation Land Passes will cover this fee for the pass holder, along with three companions. No pets (except ADA-service dogs) are allowed on the island. A free permit is required for service dogs, which must be arranged in advance. There are no roads on the island, and despite services at Rock Harbor and Windigo, the NPS states that they manage the island as a wilderness. 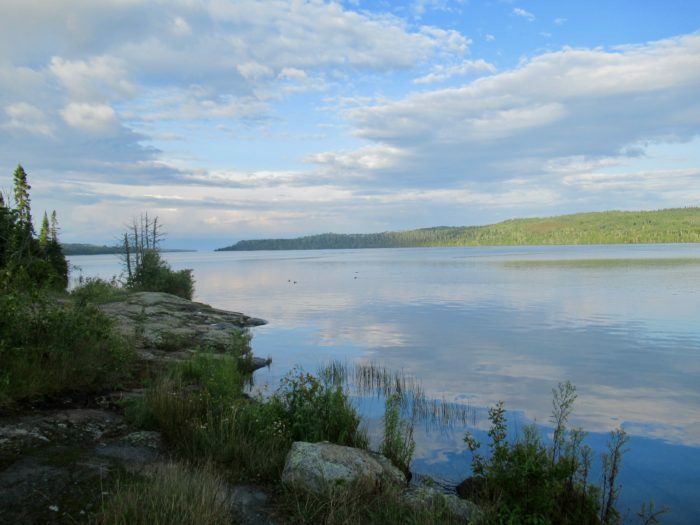 Isle Royale is accessible only by boat or seaplane. Ferries depart from Houghton and Copper Harbor Michigan, or from Grand Portage, Minnesota. There are two ports of arrival on Isle Royale: Windigo on the west side, and Rock Harbor on the east. Ferry length varies between two hours (Grand Portage to Windigo) and six hours (Houghton to Rock Harbor). 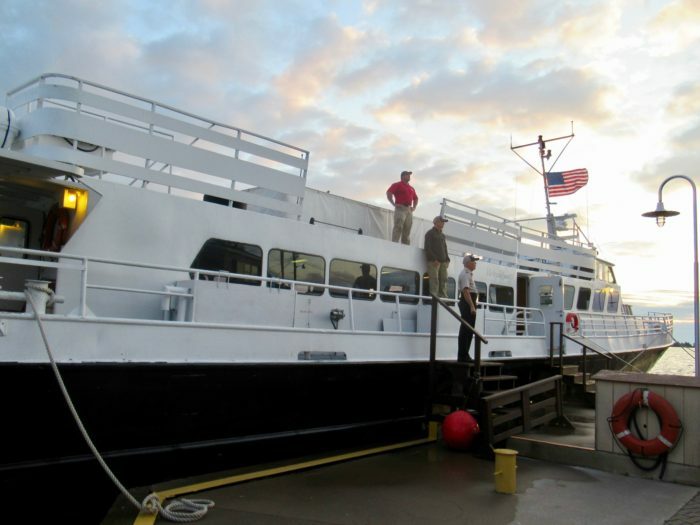 Each ferry is run by a different operator, and the only daily service from the mainland to the island is the Copper Harbor to Rock Harbor route. Fares vary by operator and are between $120-$140 roundtrip. A seaplane takes only 35 minutes but is considerably more expensive at $220 roundtrip. The NPS has a well-organized website with links to all of the operators. Consult this closely, and make your ferry reservations in advance, as boats are often fully booked in the busy months. Additionally, there is a water taxi available for hire to pick-up or drop-off visitors at backcountry campsites. Advanced reservations are recommended (there is no cell phone service on the island). Watching the sun rise and set over Lake Superior is reason enough to visit. To the south, you see nothing but blue; and to the north, you can make out Canada. While Isle Royale is a boaters paradise, backpackers also reap plenty of rewards. Blueberries, raspberries, and thimbleberries line the trails in late summer and early fall. 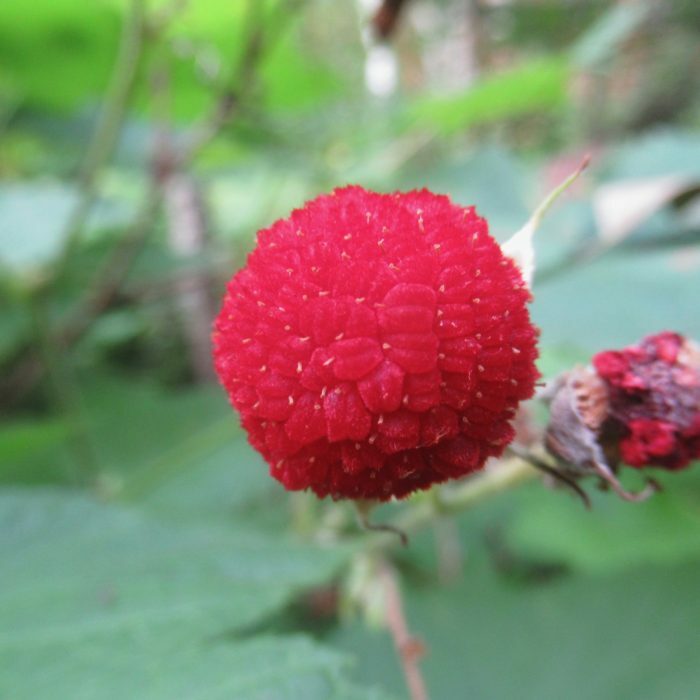 If you don’t know what a thimbleberry is, you’re in for a startlingly delicious treat. The berries are plump, sweet, and slightly tart, with a jammy finish. You may have heard of the wolves that arrived on Isle Royale in the 1950s using ice bridges. They survived due to a robust moose population, and the ample food source caused the wolf population to eventually peak at 50. Unfortunately, they have been dying off since then. Due to disease, and the impacts of inbreeding, there are now only two non-breeding wolves left on the island (and nearly 1600 moose). Recently, the NPS has released a statement indicating that they are leaning towards reintroducing wolves to the island to fulfill an apex predator role and help control the moose population. In the future visitors may have a chance to glimpse, or at least hear, a wolf again. Regardless, if the NPS reinstitutes wolves on the island, it is still a picturesque wilderness worthy of the trip. The island is open for visitation from April 16th-October 31st, leaving just 5.5 months for recreation. Despite being one of the least visited National Parks, Isle Royale is quite crowded late-July through August. 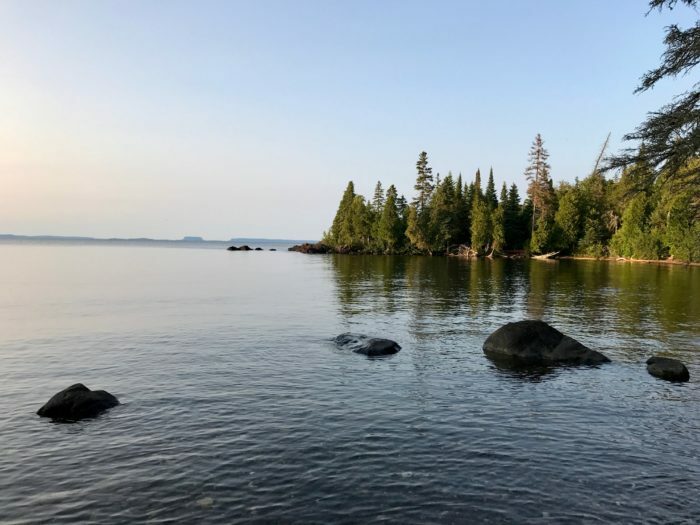 Being an island in Lake Superior, and having many interior lakes of its own, Isle Royale can be notoriously buggy in June and July, with gnats, black flies, and mosquitoes. While the insects start to dry up after July, wet summers will sustain the population later. If visiting during this season, be prepared with bug netting and/or DEET if you use the stuff. If you visit in June, before the island becomes crowded, you’ll have a better chance at scoring a screened-in shelter to yourself for extra-bug protection. July and August are the warmest months, with average highs in the mid 70ºFs, and lows close to 50ºF. Autumn brings fewer crowds, but decidedly cooler temperatures in September (high/low of 64/43ºF) and October (52/33ºF). Spring temperatures are just slightly warmer than the fall. The island sees plenty of rain, averaging about 3.5 inches/month when the park is open. Since temperatures are often in the 50s, hypothermia is a real danger. Plan accordingly with appropriate rain gear, and an extra layer to stay dry and warm. There are 21 backpacker campgrounds on the island, with 15 additional campgrounds accessible by boat only. All campgrounds have an outhouse, tent sites, and are situated near a water source. Most of the campgrounds located on the Lake Superior shoreline have multiple three-sided screened-in shelters, and picnic tables. All overnight stays on the island require a free camping permit only issued onsite at the Rock Harbor or Windigo ranger station. After passengers dock, and listen to a 15-minute mandatory LNT ranger talk, they proceed to the ranger’s station to obtain a camping permit. The ranger will expect you to produce an itinerary detailing where you plan to stay each night. Permits are non-binding, and visitors are free to change their plans as they see fit, providing they revise their permit by hand if changes occur (all permits are required to be submitted to the rangers office before leaving the island). Even with a permit, campsites and shelters are still first-come-first-serve; however, when the sites are full, visitors are expected to share their sites and shelters with those arriving later. Advance reservations and camping fees are only required for parties of seven or more. Arrangements can be made for cross-country travel and camping at the ranger station; however, the park notes that island terrain and dense vegetation makes cross-country travel and camping difficult. The NPS requests that you practice “proper” food storage. Since there are no bears, “proper” is left up to the discretion of the backpacker. There are fox, squirrels, and mice on the island so food should be attended or properly sealed when not in use. 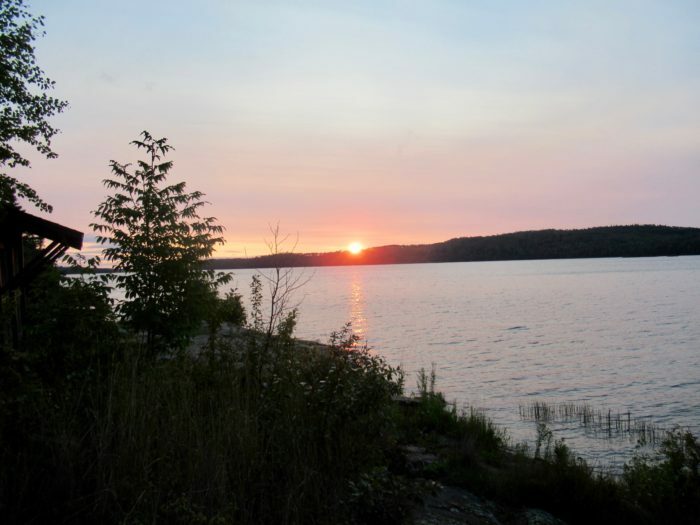 All established campsites on the island have a water source, generally either Lake Superior or a smaller inland lake. The water is clear and filters easily. The NPS recommends a 0.4-micron filter, to filter out possible parasites in the water (for reference, Sawyer Squeeze is 0.1-microns). Later in the summer, there is a risk for blue-green algae blooms in the interior lakes. If this occurs, the contaminated lakes will be posted online and at the ranger stations. Blue-green algae can be toxic, and filtering, chemicals, or boiling will not remove the toxin from the water. Campsites range from 2-12 miles apart, and water sources between them can be less predictable as streams on the island are unreliable. Any trails along the shorelines will have ample water. Most trips to the island will not require a resupply; however, The Lodge at Rock Harbor will hold boxes of food and supplies for a fee (but no fuel). Additionally, there are two restaurants at Rock Harbor, and small stores in Rock Harbor and Windigo that sell food, beer/wine, and supplies. The food tends to be mostly snacks, but Rock Harbor has dehydrated backpacking meals. The stores are expensive, and not reliable sources of food (especially the store at Windigo); however, if you realize you miscounted a day on the boat ride over, you would be able to cobble together enough calories for an extra day or two. 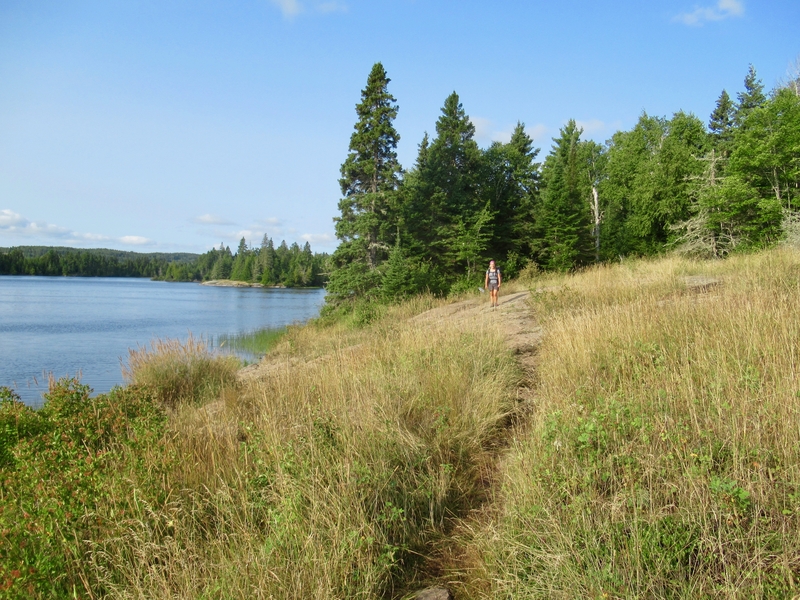 On the park’s Backpacking & Camping FAQ page, they state that most experienced hikers hike 8-10 miles a day, and take 4-6 days to make the 40-mile journey from Rock Harbor to Windigo (a ferry or water taxi can help facilitate transportation between the two harbors). In my opinion, if you’re an experienced hiker who is comfortable with 20-mile days, you will be able to accomplish that on the island. Hiking that distance definitely put me in the minority of visitors, and I found myself competing for campsites with boaters and hikers who had made camp at noon. If I were to go again, I would wait until early September to avoid the crowds and bugs. If you’d like to read more in-depth about my trip, you can do so here. Very nice. 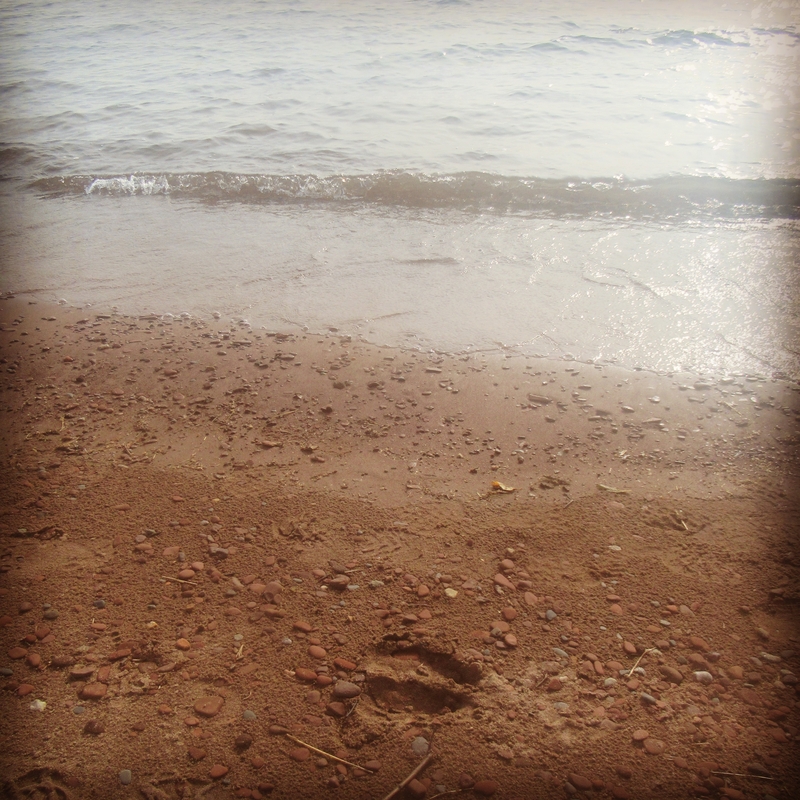 I loved Isle Royale. Spent 4 nights there over Memorial Day this year. Took the NPS ferry from Houghton. Went from Rock Harbor to Daisy Farm the first day, to East Chickenbone on day 2. Day 3 was the best hiking along the Greenstone Ridge and down to Lane Cove. Then Day 4 took us back to Rock Harbor and left early day 5. Lane Cove is one of my favorite campsites that I ever had. Lane Cove was supposed to be my campsite the last night, but due to all cold day rain we stopped 5 or so miles short at Daisy Farm when we saw an open shelter to get somewhat dry. Hopefully, I’ll go back, and make Lane Cove a priority! It was interesting to get there because the beavers had dammed up one of the creeks enough that the walkways that they built over the swamp was submerged nearly a foot. They would be floating but as you stepped on them, they would sink. Had to be real careful not to slip and fall off the side. Our second day from from Daisy to Chickenbone was pretty miserable. It was spitting raining most of the day and the trail was a muddy mess. Really glad we enjoyed Greenstone Ridge and Lane Cove as much as we did or that would have been the defining memory of the island. Thanks for the heads up on Lane Cove. Planning on doing a 100 mile trek of the island this coming summer. I will be sure to stop there. I made my first trip to Isle Royale about a week before Nate this year. The weather really wasn’t great, I was surprised by the number of downed trees, I had some self-induced set backs, and I ended up camp-bound too close to a group camp of well behaved, but loud, school kids. I can’t wait to go back. I had two days where it poured, once for an hour and the other time all day long. Still had a great time on the island, and can’t wait to go back again. Glad you’d like to go back, too!